I'm not sure about you, but I struggle at times with my focus. I get to work and I'm thinking about something at home. I get home and I'm thinking about a project I need to do for work. I'm watching my daughters playing outside and I'm trying to get some blogging done on my laptop. These are examples of distracted, scattered thinking. 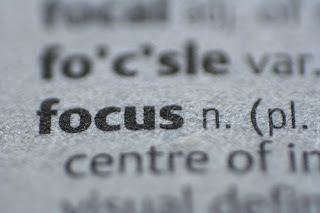 When you are at work, focus intensely on accomplishing 2-3 projects or tasks that are vitally important to what you do. At the end of the day, make a list of the next 2-3 projects that you need to accomplish the following day. Leave your short list on your desk and then walk away. On the drive home from work, use that time to decompress and purge your mind from the day's work. When you arrive home, focus on your family. Invest quality and quantity time with them. Play outside with your kids. Converse with your spouse. While at home, minimize distractions wherever possible - cellphones, voicemail, and email. Avoid working at home whenever possible. When you do need to work at home, try to establish set times that least interfere with the family schedule. You're not going to be the most effective in your work if you allow personal distractions to steal your focus, and you won't give your family your best time at home if you are distracted with work. Wherever you are, be all there.